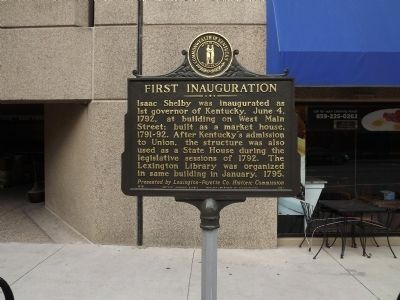 Isaac Shelby was inaugurated as lst governor of Kentucky, June 4, 1792, at building on West Main Street; built as a market house, 1791-92. 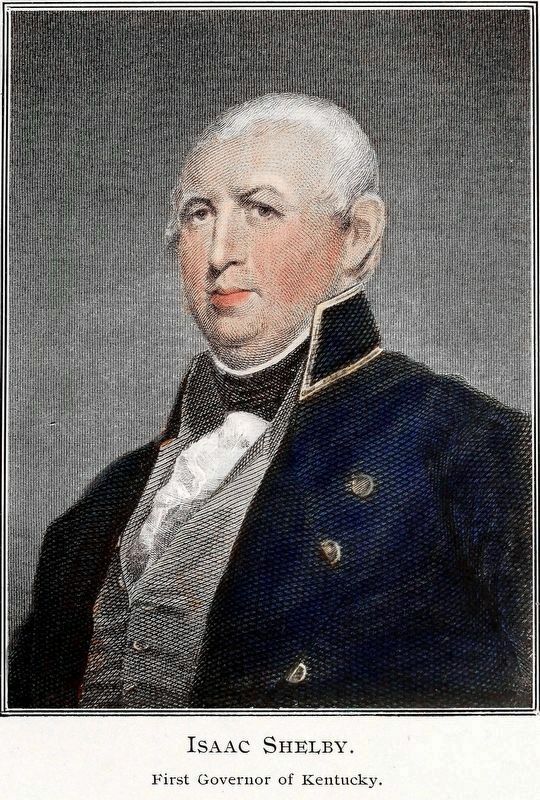 After Kentucky's admission to Union, the structure was also used as a State House during the legislative sessions of 1792. The Lexington Library was organized in same building in January, 1795. Location. 38° 2.91′ N, 84° 29.973′ W. Marker is in Lexington, Kentucky, in Fayette County. Marker is on W. Main Street (U.S. 60, 421) east of N. Broadway Road (U.S. 68), on the right when traveling east. Touch for map. 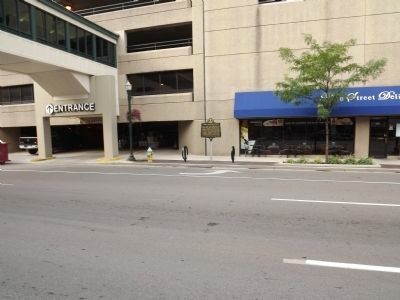 Marker is in this post office area: Lexington KY 40508, United States of America. Touch for directions. away, measured in a direct line); Lexington (about 400 feet away); John Cabell Breckinridge (about 400 feet away); Lexington Courthouses / Cheapside (about 400 feet away); U.S. Vice President (about 500 feet away); Fayette County (about 500 feet away); Fayette County World War I Memorial (about 500 feet away). Touch for a list and map of all markers in Lexington. More. Search the internet for First Inauguration. Credits. This page was last revised on April 20, 2018. This page originally submitted on August 30, 2013, by Ken Smith of Milan, Tennessee. This page has been viewed 396 times since then and 6 times this year. Photos: 1, 2. submitted on August 30, 2013, by Ken Smith of Milan, Tennessee. 3. submitted on April 19, 2018, by Allen C. Browne of Silver Spring, Maryland. • Al Wolf was the editor who published this page.